"When this book made its first appearance in 1958, it was well received by lovers of Yoruba history and culture. Indeed, the most famous scholar of the Yoruba at that time, Professor S. O. Biobaku, who encouraged the project, supplied a foreword to the first edition. The reason for reprinting this book is exactly the same reason expressed many years ago: a new generation remains ignorant of the history of their people. The central focus is the city of Ile-Ife; the author, the late J. A. Ademakinwa, was an Ife indigene. He puts the mythologies and traditions of his people to good use to speak to a host of subjects.?. . .
"Ademakinwa?s book fulfills the goals set out by the author, conveying ideas to understand historical events within the idioms and conception of history by his own people. It links rituals with mythologies to explain events and phenomena. 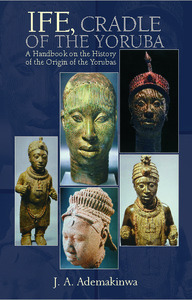 It explains the formation of Yoruba customs and culture in combination with traditional accounts that tell us about Yoruba history and culture. The book deals primarily with a past that is no more, that very distant time not covered by scientific explanations but by mythologies. In this sense, the myths are valid within the rubric of traditional stories. The book can be enjoyed at multiple levels: as the history of Ife and the Yoruba; as a body of impressive myths about the past; and as the memory of a different age.? J. A. ADEMAKINWA is believed to have been born in Ile-Ife sometime in 1894 according to the Yoruba traditional method of age calculation in the absence of official birth registry records. He was among the earliest Ife indigenes to embrace the Christian faith. As a result of this conversion, he was admitted to the CMS Primary School, Aiyegbaju, Ile-Ife. His brilliant performance at the school earned him a scholarship to the prestigious St. Andrew?s College, Oyo from where he graduated in 1918. Upon graduation, he taught in several schools in the Old Western Region of Nigeria before moving to Lagos in 1928 where he continued his teaching career and eventually retired. During a teaching tenure at Ijebu-Ode, he met a fellow teacher and an indigene of the town, Victoria Abosede Oluyemi-Wright whom he later married in Lagos in 1930. The union was blessed with six children. J. A. Ademakinwa was one of the founding members of the Yoruba Research Council. Between the early 1940s and late 1960s, he was a regular contributor to major Lagos-based newspapers as well as Radio programs. He was also the author of The History of St. Andrew?s College, Oyo and The History of Christ Apostolic Church (both written in Yoruba language). He died in Lagos in 1971.